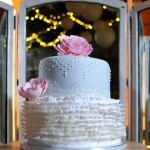 Today’s cake was delivered safely just as small drops of rain began to fall on a beautiful Autumn Saturday. The venue was See Plus Function Centre at The Wharf, Mooloolaba – a great location for any function or event, especially a wedding. 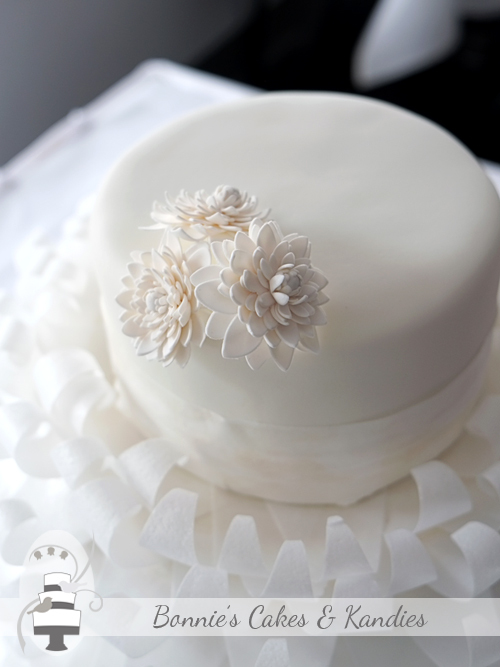 The cake featured 3 small, white chrysanthemums made from flower paste and arranged together off-centre on the top tier. 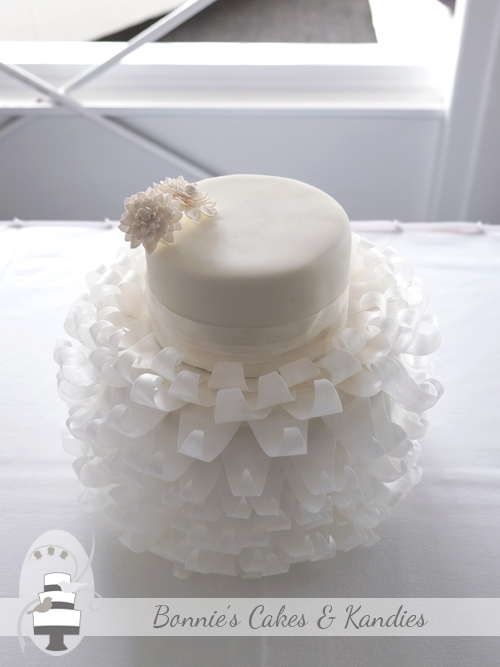 A full skirt of edible frills added a whimsical, yet soft and romantic feel to this cake, which was inspired by a Zoe Clark design. 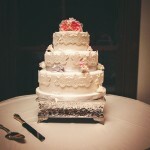 Resembling a wedding dress itself, the cake matched beautifully with the bride’s gorgeous gown. 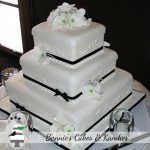 Both tiers were made in dark chocolate mud cake, and covered with rolled white chocolate fondant icing. 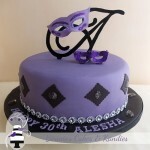 My ‘signature’ was present, as usual – this time tucked away and hidden under the frills. 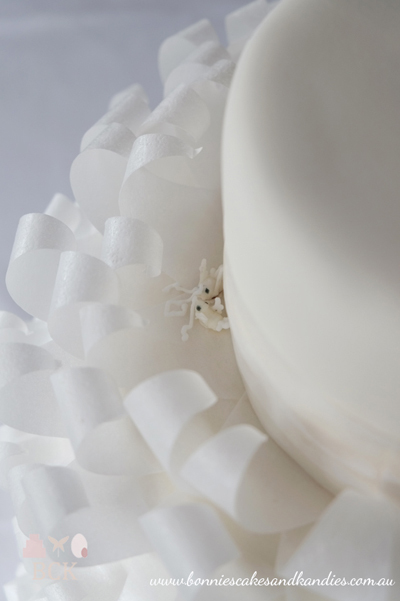 Sweet little doves (my little-known cake ‘signature’) nestled at the base of the frills on this beautiful Mooloolaba wedding cake | Bonnie’s Cakes & Kandies, Gympie & Sunshine Coast. 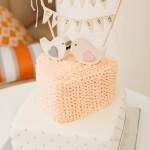 Very best wishes to the happy couple for a wonderful future together! 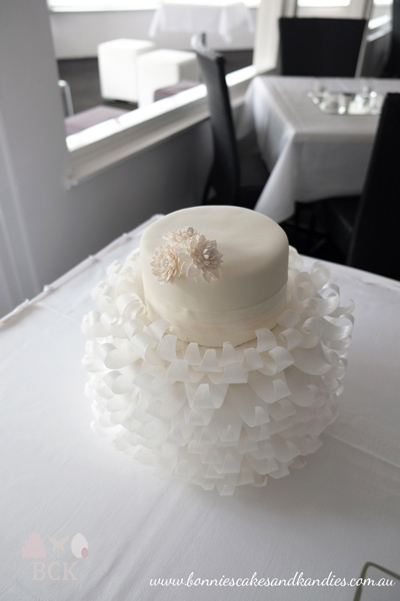 Romantic, white wedding dress cake set up at See Plus Function Centre, Mooloolaba | Bonnie’s Cakes & Kandies, Gympie & Sunshine Coast.